Take phentermine can you buy ventolin online exactly as prescribed by your doctor..
Andy and his assistant came this morning to remove the stained glass windows and board them up. The two casement windows came out easily as they just had to pull the hinge pins, but the other windows took a bit of work. 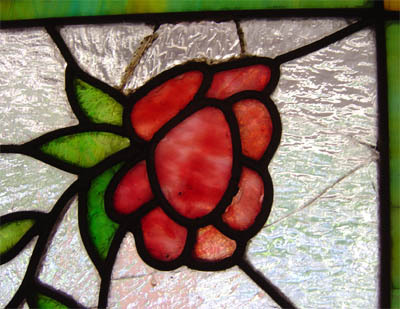 When removing old (fixed) stained glass windows, you’ve got basically two paths to take: Remove the glass with the frame intact (disassembling some amount of trim in the process), or remove just the windows by chipping out the old glazing and pushing the window out from the inside. Andy decided to take the latter approach with the foyer window and the two living room windows. While it took some effort to chip out all the old glazing, they got the windows out in one piece. The whole removal process took under two hours, but it took them another hour or two to carefully board up the windows and place the storms back in. M. put some old towels under where they were working, so there was hardly anything to cleanup. After removing the glazing, they were surprised to discover that the nails holding the window in place were square! And here’s Andy’s helper removing the glazing from one of the living room windows. You can really see how badly the window is bowing out by looking at the reflections on the different panes of glass. So off they went with our windows and now we’re looking forward to living in a cave for a week. If all goes well, they’re coming back next Friday to put the windows back in. I’m very much looking forward to getting these all fixed up. 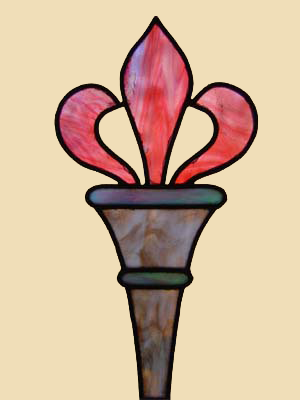 We’ve decided to have Circle Studios repair the stained glass windows. They’re planning on coming next week to take the windows out and board them up. Fingers crossed! If eyes are the “windows to the soul” of a person, then windows are the eyes to the soul of a house. When we first saw the Old Man, the eleven stained glass windows were one of the things that really caught our attention, but for three very different reasons: First because there were so many of them, second because they were so beautiful, and lastly because they were in such horrible condition. Several of the windows were missing pieces of glass, and another few had broken pieces of glass in them. 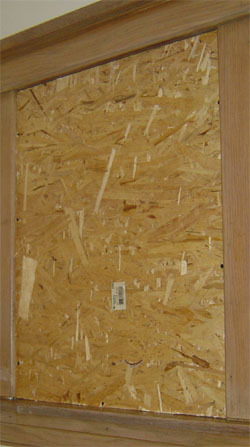 One had been repaired with scotch tape, and another looked like someone had tried to glue the broken glass back together with wood glue. We walked away from the Old Man that day and continued our house hunt elsewhere, but fate (and a very determined wife!) brought us back to the Old Man six weeks later. 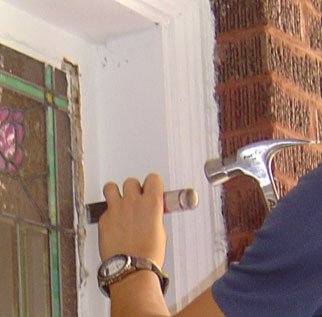 We found that, in addition to the myriad other small repairs and fixes that had been made, the owner had repaired the windows that were missing panes–and done a really fine job of it. It made a huge difference in the way the house looked and we went ahead and made an offer on the Old Man–one year ago today in fact. However the remaining stained glass windows still had problems. The window in the foyer had two broken panes and air was coming in through the cracks. One window in the living room was bowing outward, leaving huge gaps between the glass and the lead, while the other window bowed inward. In the dining room, the leftmost and rightmost casement windows bowed out precipitously and had gaps worse than the windows in the living room. On top of that, every time I’d open and close them, they would shake and rattle horribly–making me wonder if they would finally give way. Well last week I stopped by Circle Studios, a stained glass studio that I frequently drive by. I often admire the beautiful stained glass windows and lamps in their studio as I drive by, but this was the first time I went inside. In short, it was breathtaking–an incredible combination of glasswork whose beauty made me absolutely giddy. 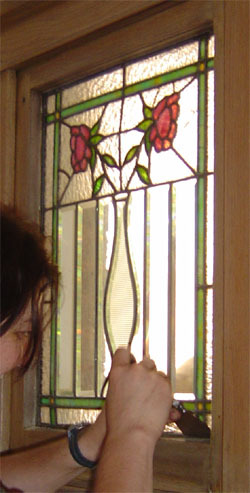 I asked them if they did repair work, and it turns out that not only do they repair stained glass, but they repaired the three broken windows in the Old Man right before we bought the house! Today, Joseph, who founded the studio, came over to make an assessment of all the windows and determine which ones needed urgent repair and which ones had minor cracks that were purely cosmetic. 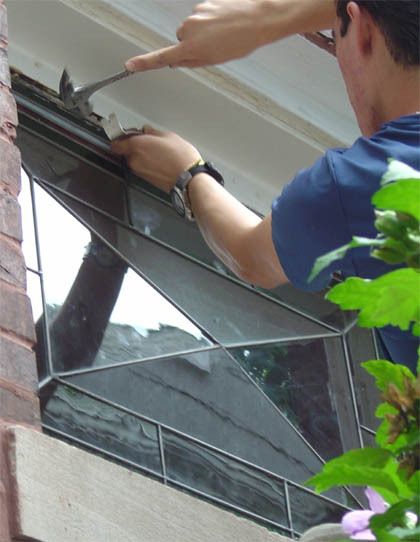 After looking at all the windows and tapping and prodding them, he recommended that we repair the five windows that I described above, which is exactly what we expected needed to be done. He even drew us up a quote for repairing all five on the spot. He thinks that they can remove the windows, board them up, repair them, and have them back in place in about a week’s time, which is a lot faster than I expected! M. and I are going to mull over the quote for the next few days and then decide whether we’re going to have Joseph and his crew do the work. The price is about what we expected, so it mostly has to do with figuring out the best time to get the work done. But enough about that, here are some pictures of the windows. The Old Man basically had the month of July off while we tended to the often-neglected thing known as The Rest of Our Lives. After suffering from a minor bout of BlogGuilt(tm), I’m back with a relatively uninteresting post that will serve as a cure for insomniacs the world over! The most excitement we’ve in the last month was when a bottle of Lestoil in the basement cracked while we were away for the weekend. It didn’t ruin anything, but the whole basement reeked of Lestoil, which smells an awful lot like some kind of flammable liquid and gave me a bit of a scare at first. However, the Lestoil did eat the paint right off of the metal shelf it was sitting on. Hmmm… maybe I’ve found yet another paint stripper! Our garden is going like gangbusters. We planted five tomato plants under the assumption that only a couple would flourish, and wouldn’t you know it that all five are doing great? In fact, we have two yellow cherry tomato plants that are delivering like 15 tomatoes a day. By the end of the month, we should have tomatoes for the whole neighborhood. You are currently browsing the The Old Man and the Street weblog archives for August, 2005.